First review is published: "The Black Cauldron," Disney's 25th animated feature, which arrived on VHS for the first time two days prior. "THE CINEMA!" joins "The Movie Ring". 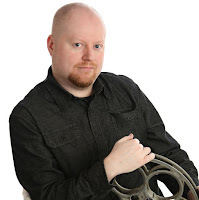 David Keyes becomes a member of the Online Film Critics Society. Site opens up section for Guest Critics; readers and fellow colleagues can submit their work and have it published on-site in their own sections. Most notable guest writer: Frank Ochieng. This continues until 2004. "David Keyes' THE CINEMA!" is renamed to "Cinema 2000." Site layout is tinkered. Menu utilizes the "image map" format. Site layout goes back to single-page html format; official title becomes "David Keyes' Cinema 2000". "Cinema 2000" officially ends its run on Geocities servers. The old version remained there until Geocities was pulled entirely offline. Cinemaphile.org is born; layout goes back to the "frames" technique, with image collage of current releases wrapping the top and left borders of the layout (these pictures and their color schemes would change once every few months to reflect the newest releases). Cinemaphile.org launches journal on RottenTomatoes.com, which serves as the posting ground for general movie-related articles for the next five months. It promptly became discontinued. Official hiatus from reviewing declared; the web site would be inactive until the following January. Last review posted on Cinemaphile.org before the eventual overhaul. Cinemaphile.org is revived, with new articles, a new interface, and an entirely new color scheme. The "frame" presentation also goes away. Cinemaphile Blog opens here on Blogspot. Further writing is published exclusively here. Older articles gradually become indexed. Longest hiatus in the site's history (2 years, 2 months and 3 days) is broken. Content stream becomes the most active in 10 years. First movie yearbook of articles -- containing all written work from 2013 -- is published digitally on the Amazon kindle store. Additional volumes follow.